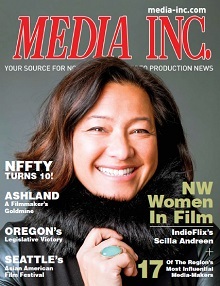 Some of the state’s most seasoned location scouts and managers talk to Media Inc. about their careers, their on-set experiences, and their favorite Northwest locations. How long have you been in the industry and how did you get into this field? I started at the University of Washington Extension Film Program and got a job on a movie with my teacher, Laszlo Pal, and his friend, Vilmos Zsigmond, in 1987. I did everything from projecting the dailies at night to driving wardrobe trucks to set in the morning and volunteering for every department possible. I was fortunate to have Chuck Fey show me how to load a Panavision mag under Vilmos Zsigmond’s camera department. Back then I was more interested in the camera department. Along the way, I worked for Alan Siegel Films/November Films for about 15 years. We were like a family, traveling all over the country making car commercials. I started as a production assistant, then started scouting and coordinating transportation, then became assistant director. The scouting part stuck. What are some recent production projects you’ve worked on? I just finished working on a Chevy Silverado music video for Tool of North America with Bob Richardson directing. The story we had to tell was about America, so we scouted from the Washington coast beaches, to the Canadian border, to the rolling hills of the Palouse near Idaho. When I have the chance to show film crews what Washington has to offer for locations, they are always surprised and end up changing their schedule, shooting more days here than they planned. When we drove through Eastern Washington on this scout, the crew, like most, had no idea that Eastern Washington could double as Utah, Arizona, or New Mexico. We shot fishing boats for coastal, wheat fields and a dairy farm for Middle America, a waterfall for the Rockies, and a cattle ranch in one of Eastern Washington’s coulees for the Southwest United States. They left Washington with more than they expected. What kind of tech gear (i.e. cameras, computers, gadgets) are you currently using? I try to keep it simple. I shoot with a Canon 5D, process my pictures on a MacBook Pro and load all locations to my Web site. On my Web site, I have access to my library of locations and organize each project into scenes or location categories and attach the relevant notes for each location. These days a Non Disclosure Agreement is more common than not, so when I work for companies like Microsoft, Amazon, Nintendo and Starbucks, my Web site provides a secure link to each project with a username and password. What do you think makes a good location manager or scout? Location managing is mostly about people skills. Hearing what the production company wants to accomplish in terms of tone, look, and feel of the overall story. Finding the locations that are needed that fit into the schedule and communicating clearly with each property owner and the immediate community. Developing true and honest relationships is the key. You can’t cut corners here! You have to do your homework. If the shoot requires a last-minute location need, I will have a better chance to solve the issue because I did my homework and developed relationships in the immediate community. If you listen closely to people you meet, the information they offer can often solve issues because of the people they know. It’s not what you know… it’s who you know. I’ve been in film about five years. I first started out as an extra in TNT’s Leverage and NBC’s Grimm. Then, through Denise Gibbs at Foreground Background, I moved up in the world to feature films such as Late Autumn, filming a scene locally here in Pasco, Washington. The other two feature films were filmed in Seattle. I have been involved in film locations for three years. My first location position was for an independent film out of Portland, Oregon. The film was Sister Mary’s Angel and soon to come, Sticks and Stones, both written and directed by Mary Knight. I found myself driving to Portland, then to Seattle, and maybe home for a day—maybe. It was at this point in my travels I thought to myself, “Why hasn’t there been much filming here in Eastern Washington?” That was when I decided to start promoting this beautiful side of the state. I take great pride in the Tri-Cities; we’ve stood tall throughout the economy and its downfall. We are a very strong community and we thrive to invest into our community. Nature Valley Soft Baked Oatmeal Squares commercial, at Skamania Lodge. Cysco Systems New York for a print ad involving apples, at Columbia Fruit Pickers. A feature film written and directed by Travis Zariwny titled Intruder. What are some of your most exciting discoveries as a location scout/manager? I’d have to say areas of land I haven’t yet discovered in my travels, I like to go home and research them. I love to learn about our history, especially the Columbia River and The Flood. I recently wrapped on Lynn Shelton’s latest feature, called Laggies. Earlier this year I did some work for a TNT pilot called Lost & Found, and also worked on the feature film Lucky Them. I do most of my shooting on a Canon DSLR, but also use some of the new features of the iPhone quite a bit, including the panorama feature and the ability to shoot short videos. Both give clients the ability to see a bit more of a particular location, or to get a sense of potential camera movement. I love discovering hidden or forgotten parts of the region. On a recent job I was given a tour of some of the basements and lost underground spaces within Seattle’s International District—many of which haven’t changed since the 1930s. A few years ago I worked on a commercial that involved a large herd of goats. The scene involved the goats jumping out of a truck onto Pine Street in the middle of the city. The shoot took place the day after one of Seattle’s freak snowstorms in December, and the entire set was covered with ice. Trying to keep the goats from escaping was a weird but very memorable experience. Finding the right balance between the creative and the practical is the essence of location management. A good scout first needs to learn how to notice interesting places that others might miss. It requires a good creative eye, but also an ability to look at a location pragmatically, to determine how a film crew would operate there. You also need to be persuasive, with the ability to convince location owners to allow filming on their property. Sometimes that is the trickiest part. 25 years right out of college, I did some basic scouting for still photographers in the late ‘80s while working as a freelance assistant. In 1990 a photographer from L.A. referred me to a large production company and a scout job involving aerials. The phone hasn’t stopped ringing since for locations. John Deere, Chase Bank, Microsoft. Underground rivers and villages in Mexico, Moab, and all the interesting sub-cultures around the U.S.
Marlboro projects and working with Cowboys. Attention to detail, staying on task and working fast.